With the help of our chess master (Mark Papenhausen) and other club members, you can learn new strategies, face new opponents, and see which rung you will dominate in our ongoing ladder tournament. For grades 6-12. New members are welcome. Refreshments are provided. You do not need to register for this event: you can just show up. We've moved the anime club to Thursday evenings. Join us for Japanese culture, films, graphic novels, and more. For teens in grades 7-12 only. Refreshments are provided. Cosplay is optional. New members are welcome. There is no need to register: you can just show up. Join us for spooky, silly, and funny monsters everywhere - in stories, crafts, and games. Create your own monsters to take home and design your own special monster sweet treat. For grades K-2. Sign up now. Sat, Oct 6th, 2-3:30pm. We may need your help with some of these creepy, slimy, and strange experiments. It may get messy, so dress appropriately. For grades 3-6. Sat, Oct 20th, 2-4pm. You and your stuffed animal friend are invited to the library for pajama-party fun, and afterward your stuffed friend can stay and spend the night. We'll have a teddy-bear-themed story, craft, and games. All participants will get pictures of their stuffed friends having fun at the library after hours. Animals will need to be picked up on Saturday (between 9 and 5). For children in grades K-2 and their stuffed companions. Fri, Nov 16th at 4:30pm. Do you enjoy the board game Clue? It's even more fun when it's life sized. Join us and find out who done it , where, and with what. Refreshments will be served. For grades 3-6. There is no charge for this program, but registration is required. Sign up in the children's room. Sat, Nov 17th, 2-4pm. Your library card is the most important school supply and card in your wallet because it opens doors to free Internet access, books, magazines, social media, eBooks, movies, music, programs for all ages and so much more! Have you lost your library card? No problem! Come to the library during the month of September for a free replacement card. Plus...show us where you take your library card. Post your picture on our Facebook Wall and be entered to win a library prize pack. The Friends of the Library will be holding their Fall Book Sale. Make traditional crafts as well as some out-of-the-ordinary ones. Registration is required. Join us for a week of special events just for teens, October 14th-20th. We'll show off what's lurking in the library. Let your voice be heard about library services to teens: fill out our survey, and be entered in a drawing for prizes. Stop by the Teen Area for special displays, book suggestions, contests, and more. Get to know the newest additions to your YA collection of books, magazines, audiobooks, ebooks, graphic novels, and more. (Materials are selected by our Teen Volunteer League.) We'll have contests, Book Speed Dating, Banned Book Bingo, video book trailers, monster cupcakes, door prizes, and more. Call or stop by the main desk to sign up. Mon, Oct 15th, 6:30-8pm. It doesn't take a lot of brains to know that this is going to be a night of creepy fun. Dress up in your best formal zombie attire and join us for a night of dancing, refreshments, crafts, zombie apocalypse survival skills, and more. A prom king and queen will be crowned, and there will also be awards for the best costumes. Registration is required. Sat, Oct 20th, 7-10pm. Get hands-on experience using a web browser to find information on the internet. This course will start you off on the ground floor and rocket you into the online world. Learn how to use a web browser, find websites, get information, manage tabs, make bookmarks, participate in online discussions, and more. Includes a Q&A session. Cost is $2 per person. Sign up at the main desk. Mon, Oct 1st, 5:30-8pm and Sat, Nov 3rd at 10am. Frustrated with your resume? Need to create a resume for the first time? Want help making your resume stand out? Join us at the Galion Public Library as we welcome representatives from Crawford County Job and Family Services Jobs Plus Unit. Learn about resume formatting, how to self-assess your skills and abilities, and how to make your resume stand out! Bring your resume if you have one! Mon, Sep 10th, 6:30-7:30pm. Join Noel Lizotte for this 1 hr. cooking demonstration. Noel's point of view is simple and easy convenience cooking. Need some new ideas? Want to learn how to get good meals out quickly? Noel will demonstrate how to make 3 simple foods and SAMPLES will be provided. After class, Noel will have copies of her newly published cookbook available for purchase and signing. Call 419-468-3203 to register. Thu, Sep 13th, 7-8pm. It's true that a meteorite was found in Crawford County this year. Want to learn more about them? Our favorite astronomer is back. This year Dan Everly will be teaching us all about meteorites and will even have some on display. You won't want to miss this discussion. Call 419-468-3203 to register. Wed, Nov 7th, 7-8pm. General Patton Comes to Life! It goes without saying that General George Patton was one of the most complicated military men of all time! He was born in November 1885 and died in December 1945...but he'll come to life at the Galion Public Library. The Library once again welcomes back Ken Hammontree with Living History Productions. Ken will portray General Patton and the Third Army as they move across Northern France into Germany during the Battle of the Bulge in the winter of 1944. It's an evening you won't want to miss! Call 419-468-3203 to register. Mon, Sep 24th, 6:30-8pm. The library is now accepting applications for the position of Children's Librarian. Learn how to consistently save 70% and more grocery shopping and over 90% toiletry shopping. Find ways to save on utilities, cell phones, restaurants, travel, gas, prescriptions, and much more! Joe Daugirdas, otherwise known as Joe the Coupon Guy, will teach you to become a saver instead of a spender! Call 419-468-3203 to register. www.joethecouponguy.com Wed, Oct 3rd, 7-8:30pm. Join the Galion Public Library Cooking Club for an evening of fall favorites. Whether it's a favorite soup recipe, bread recipe, Halloween treat, etc., bring your dish and the recipe and enjoy an informal evening all about FOOD. This is a great way to get new recipes and ideas! Call 419-468-3203 to register. Tue, Oct 9th, 6-8pm. Learn make-up techniques for this year's Halloween Costume. Local theater students will teach horror, glamor, and fantasy make-up tricks that you can use at home. Registration is required. Call or stop by the main desk to sign up. Wed, Oct 17th, 6:30-8:15pm. How to Self-Publish Your Work! Have a dream of getting your work published? Join Noel Lizotte as she shares her dream with you and provides her insight and tips along the way. This 45 minute presentation will take you through 3 main steps. Defining your dream, Picking the right publisher for you and Working with your publisher. Question and Answer time will follow. Call 419-468-3203 to register Thu, Oct 11th, 7-8pm. 2012 marks the 75th anniversary of Bishop Brown's passing. What a great time for the library to partner with the Galion Historical Society for a ghost haunt at Brownella Cottage. Those 18 and older can join us for an evening with the paranormal team at Brownella. Will we see or hear anything from beyond the grave? This ghost haunt is FREE, but registration is required. Please call 419-468-3203 to register. Limited spots available. Wed, Oct 17th, 7:30-9:30pm. Join us at the library from 1-3pm on Saturday, December 1st for our annual holiday open house event. There will be music performances throughout the afternoon, crafts that you can make here and take with you, prize drawings, refreshments, an art show, a visit from a famous mouse, and more. There is something for everyone for Halloween this year! If you've done the trick-or-treating, corn mazes, and haunted house...it's time to try something new. 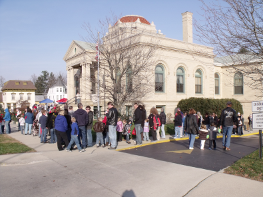 Come to the Galion Public Library to enjoy the holiday...book style. The library welcomes Spoken Images! This Ashland/Richland County based readers theatre troupe has performed publicly throughout Ohio since 1997. As the narrator sets the framework for the dramatic presentation, other actors use their voices, facial expressions, and hand gestures to interpret characters in the stories. On tap for the evening...SPOOKY GHOST STORIES. Come if you dare! Mon, Oct 29th, 7-8pm. November is National Novel Writing Month and the Galion Public Library is celebrating in a big way! Ever had the desire to write a novel? We encourage and challenge you to do it in the month of November. Write 50,000 words in November and you can be a winner! Sara Gruen's bestselling Water for Elephants was written during NaNoWriMo. What's stopping you?! To help you reach your dream, the Galion Public Library along with Galion author, Rachel Mendell, will provide you with writing time, encouragement and support. Join us for our kick-off workshop on October 31st and write throughout the month at any or all of the 4 write-ins offered. Visit nanowrimo.org for more information about this national program. Wed, Oct 31st, 7-8pm, Mini-Workshop kick-off. Are you intrigued by Genealogy? Want to know more about your family? Maybe you're not sure how to get started. Join us at the Galion Public Library for our 2-program genealogy workshop. Accredited Genealogist Peggy Lauritzen will be conducting the workshops. The theme for November 5th is Getting Started , and the theme for November 12th is Digging Deeper/Up in Smoke! . Please bring any information you have up to your grandparents. Mon, Nov 12th, 6-8pm and Mon, Nov 5th, 6-8pm. 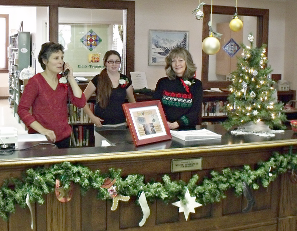 Stop by the library and say farewell to Ellen, our departing Children's Librarian. Ellen and her family will be moving away, so don't miss your chance to say goodbye. Thu, Nov 15th, 5-6:30pm. Children of all ages, come to the library and make holiday crafts that you can take home. Registration is not required: you can just come in at any time during the day. Thu, Dec 27th, Wed, Dec 26th, and Fri, Dec 28th. 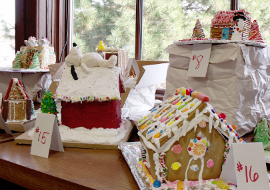 Our annual Gingerbread House contest is back! 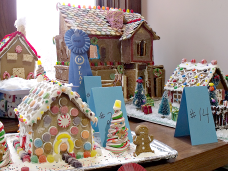 Gingerbread houses this year can be constructed out of any edible ingredient (not only from gingerbread). Entries will be judged in three categories: 9 and under, 10 and up, and groups. In addition to the first and second place prizes for each age group, we will also be having a grand prize for Best in Show. Gingerbread houses should be brought to the library during the week of November 26th. Your creation will be put on display at the library. Patrons are encouraged to visit the library and vote for their favorite house during the week. Judging will take place on December 1st. Contestants do not need to be present to win. Gingerbread Houses can be turned in starting November 26th. They must be here for judging before 10am on Saturday, December 1st. The earlier you get them in, the more chances you have to win the Best of Show Competition! Come out and support your favorite team and enjoy football-themed crafts and games. Refreshments will be served. For grades 3-6. Sat, Jan 19th, 2-4pm. Stop by and decorate a cake pop or two of your very own. We'll have other chocolatey-good activities as well. You can come any time between 2 and 4pm. Sat, Feb 16th, 2-4pm.